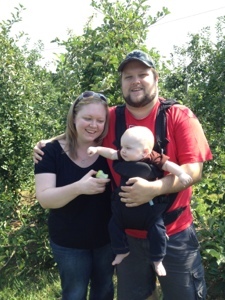 Christian, Kristin and CJ enjoying an afternoon of apple-picking. I am a husband and father, a minister, and a Unitarian Universalist. But my story started in a very different place. I grew up in Austin, Texas, and attended public schools, including the LBJ Science Academy, a magnet high school where I was honored as a National Merit Scholar. I accepted a full scholarship to attend the University of Houston, where I eventually majored in English and worked for the student newspaper (I also very sporadically attended the First UU Church of Houston during that time). After college, I worked in journalism, first for a paper in Natchez, Miss., then back in my home state in Bryan-College Station. In one of my darkest moments, I turned to a Unitarian Universalist church for help. I was grieving the death of a friend and mentor, I had been desperately unhappy with the place I was living, and I was looking for a new start – indeed, looking for something that I didn’t even have the words to articulate. And I found it, in large part, in the Unitarian Universalist Church of the Brazos Valley, and in the community of Bryan and College Station, Texas, where I moved for a new job and found a faith community. Of course, saying it like that makes it sound like it was easy or that it happened in a moment. At the time, I didn’t even know what I needed, but I knew I was in trouble and I wasn’t sure where to turn. I went to the UU church, the faith that my mother had grown up in, that my parents had been married in (though we never attended when I was growing up), and a sister church to the one I had occasionally attended while in college. I walked into the UU Church of the Brazos Valley (UUCBV) on a weekday afternoon, where I was greeted by the church administrator. She had been closing up, but opened up the church for me to give me a quick tour, and invited me to come back on Sunday. It was a couple weeks later when I did just that, and knew that I had come home. I met four young adults at that first worship service, people I just connected with on a deep level almost immediately. I jumped into church life with both feet, joining and soon chairing the worship committee, teaching religious education and advising the youth group, and really becoming a part of this church community that had welcomed me with open arms. But though I felt a connection, a deep sense of belonging and purpose that I had never felt in quite the same way before, I didn’t really understand it, and I certainly couldn’t articulate what I was feeling or thinking. I knew that church had made and was making me a better person. They were supportive, loving, caring, and sometimes challenging. I heard viewpoints that were radically different from my own and ones that I shared, and learned from both. And I was challenged to live out my values in the public arena, not merely in a private way. My church had both a historic and a contemporary strength as a liberal voice in a deeply conservative community, advocating around issues of racial oppression, sexual orientation and identity rights, and working with local communities to support affordable housing and work to end hunger. The community I found there gave me a place to begin to talk about what I truly valued, which over time I have realized comes down to this; my call is to help people become the best person they can be and then to help them go out and make a better world. In 2009, I answered that call to ministry by applying to and then enrolling at Austin Presbyterian Theological Seminary (an institution that has had a UU presence off and on for many years). I transferred to Andover Newton Theological School after my first year when my fiancé, now wife, received a job offer in Boston. At Andover Newton, I continued my studies and then graduated in May 2012 with a Master of Divinity degree. I also began my internship in the last year of my studies, and was blessed to be chosen as the ministerial intern at the First Parish in Needham, where I worked with the Rev. John Buehrens, not only a terrific parish minister but also a former president of the Unitarian Universalist Association. Through the last several years, I have deepened and better defined my call to ministry. I also had the opportunity to work for three years at the Unitarian Universalist Association headquarters in Boston on the staff of UU World magazine. I am currently serve as minister of the First Parish in Malden, Universalist, in a full-time, settled position. I am blessed to serve this historic congregation as it moves into a new era of its existence.